I have Chopper, all gear 8 decent mods, and the BEST I’ve done is killed one DT and got through the other’s protection. Gonna have to gear up/switch mods, but I’m digging that it’s very hard. Lots of events are too easy. This one is brutal, which is good. Sabine's better than Chopper. You don't need 3 tanks. Thts amazing! Mind sharing how you did the last phase? i.e who did you kill first or last? I didnt farm ezra, having issues like crazy now trying to finish last wave. I even made a thread describing the whole process, unfortunately I edited too fast and it went for a review.. The first thing you need is Kanan and Ezra to be very close to 100% TM at the end of Stage 3. This way you can Taunt with Kanan as soon as possible and you can Dispel the Stormtrooper with Ezra. After that you focus on the DTs. Leave Thrawn for last. I have chopper and struggling hard. After DTs you focus everybody else(excluding Thrawn, he is last). Come on people. I did it first try with this group. It's not that hard. READ what the Phoenix abilities are and use them all. There were many many threads about squads for Thrawn event. You could have read them. Good for you. A lot of depends on RNG. It's a difficult event that took me several tries to get. A lot of it depends on who Thrawn fractures first. Zeb was critical for me. Didn't seem that difficult. Backup plan works even if fracture is up. Again, RNG for you was graceful. RNG is an excuse. All these legendary events are tuned the same G7/G8 can clear. The only one that wasn't was the 1st time Yoda came and they changed it because it was to difficult. My reaction to everyone complaining about RNG. Well yes, a wrong fracture can mess you up, especially if you don't have Chopper, but to me it did not feel like the gear level made that big a difference. My potency mods for sure made a bigger difference than a gear level, and on my kill I had 4/5 up. Zeb really was mvp here, and using him well is the difference between being completely destroyed or neutralizing half of the enemy's potential to hurt you. This is a challenging event. Anyone saying RNG doesn’t matter is either in top speed mods or is lying to get a rise out of people. What thrawn and deathtrooper do in first two turns is crucial. Knowing the kill order doesn’t affect that. The rng makes that wave god tier or terribad and everything in between. Don't understand all you whiners. You all want one of the best toons in the game handed to you. If you did any research you would have known g8 px would require very good rng and take many attempts. I really wish you could fight this event again. You would be so much more thankful. You got INCREDIBLY lucky. This event is 100% RNG dependent. I went 23 battles without killing a single trooper in Wave 3, then beat the event easily. Yes! Just got him 7*! It was totally RNG dependent especially since I didn't want to move mods around so I just added some mods I got from my farming for speed secondaries for Poe and leveled them up to level 12 to see the secondaries. I think this was at least my 15th try today when I finally got it and it was all due to RNG. I hit auto and basically just directed the hits as much as I could and finally got a good run where Thrawn didn't immediately fracture Zeb/Hera/Ezra and the auto actually used the dispels when I needed them. I kinda messed up going for the taunter stormtrooper rather than the healer but still managed to beat it with Zeb, Ezra, and Chopper standing which was really helpful because Thrawn fractured Zeb and I thought I was done but Chopper's taunts really helped keep Zeb alive so he and Ezra could double team Thrawn. Ezra's double hit on his basic really helped because that was what managed to kill Thrawn. 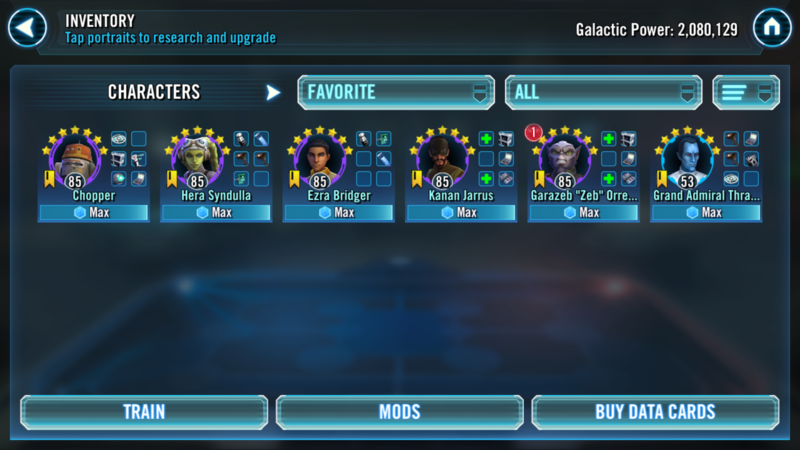 All of my Phoenix are g8 and only Ezra/Zeb at level 85 so it's doable at g8 and less than max level. Just keep plugging away and you should get RNGesus to smile down on you.